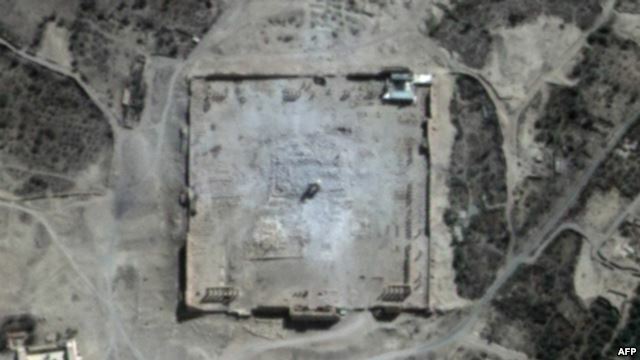 The United Nations says satellite photos confirm Islamic State (IS) militants blew up another ancient temple in the historic Syrian city of Palmyra. A U.N. agency posted images of the Temple of Bel taken on August 27 and the same site taken Monday — one day after Syrian observers said the temple had been destroyed. But Syria's antiquities director Maamoun Abdulkarim said he believes at least part of the temple is still standing. He said Monday there had been a big explosion at the site, but that no one has been able to get close enough yet to confirm how much, if any, of the temple survived. The Temple of Bel is nearly 2,000 years old and Syrians consider it to be one of the country's most important religious shrines. Last week, IS posted pictures on social media showing militants destroying another ancient Palmyra temple, Baal Shamin. The U.N. calls it a war crime. Archeologists and historians say they are outraged, while ordinary Syrians are expressing despair over the systematic destruction of the country's history and heritage. That is, until the IS group occupied Palmyra in May. Mamoun Abdel Karim, head of Syria's Department of Antiquities, told Syrian state television the militants do not view Palmyra's ruins from a cultural or historic vantage point, but rather as a heresy of past cultures from their own Takfiri perspective, which views others as heretics. Syrian Minister of Tourism Bashar Yaziji decried the latest destruction of a historic site while trying to draw world attention to the acts being committed by the group. "Temple of Bel symbolizes Syria's historic and cultural heritage," he said in Arabic, urging Syrians across the world to help defend their past, which is now under attack. The British-based Syrian Observatory for Human Rights said two weeks ago IS beheaded Palmyra's former antiquities director, Khaled Asaad, and publicly displayed his body. IS seized Palmyra in May and historians immediately put out a global alarm. The militants call priceless ancient artifacts and statues blasphemous. They also have destroyed other historic sites in Iraq.